The United States Congress designated the Wheeler Peak Wilderness (map) in 1964 and it now has a total of 19,154 acres. All of this wilderness is located in New Mexico and is managed by the Forest Service. About 135 million years ago a tremendous geologic uplift created the Sangre de Cristo Mountains. Wheeler Peak Wilderness now marks the top of this rugged range, with Wheeler Peak, at 13,161 feet, standing higher than any other point in New Mexico. 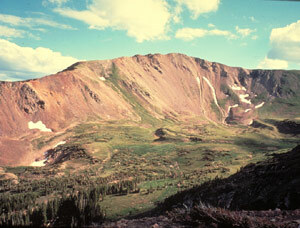 Alpine tundra, rare in the American Southwest, covers Wheeler and other nearby Wilderness mountains. As for wildlife, the most activity takes place in the short four-month "summer," when elk and mule deer visit, golden eagles soar in the clear skies, songbirds are ubiquitous, and marmots and pikas have their run of the place. Mountain lions and black bears have been seen here, too. Big Horn sheep use the wind-swept high elevation tundra year-round. Taos Ski Valley abuts the northern boundary, and a trailhead there (specifically at Twining Campground, which has a parking lot) accesses a trail system leading to myriad peaks and lakes and long talus slopes. The Wheeler Peak Trail starts near here and travels a well-defined path that leads to the summit of the state, a distance of approximately eight miles. You'll need no technical gear to attempt this hike. From the summit you can choose to continue on a trail to Horseshoe Lake; or follow the ridge to Simpson Peak and Taos Cone and on into Sawmill Park, where you can exit the Wilderness on the East Fork of the Red River. About half the annual precipitation of 40 inches falls in summer and half in winter (when it appears in the form of fluffy white flakes). Cross-country skiing and snowshoeing are popular, but beware the danger of avalanche. This is an attractive, easily accessible, and heavily used area. Planning to Visit the Wheeler Peak Wilderness? How to follow the seven standard Leave No Trace principles differs in different parts of the country (desert vs. Rocky Mountains). Click on any of the principles listed below to learn more about how they apply in the Wheeler Peak Wilderness.